Don’t say we didn’t warn you, kid. Solo spoilers follow below. Before Han Solo ever shattered the Kessel Run record, shot poor Greedo, or teamed up with cuddly Ewoks to fight the Empire, he was a lowly Corporal in the Imperial Navy. Han stamped his ticket off his home planet of Corellia by enlisting in the Imperial Navy. 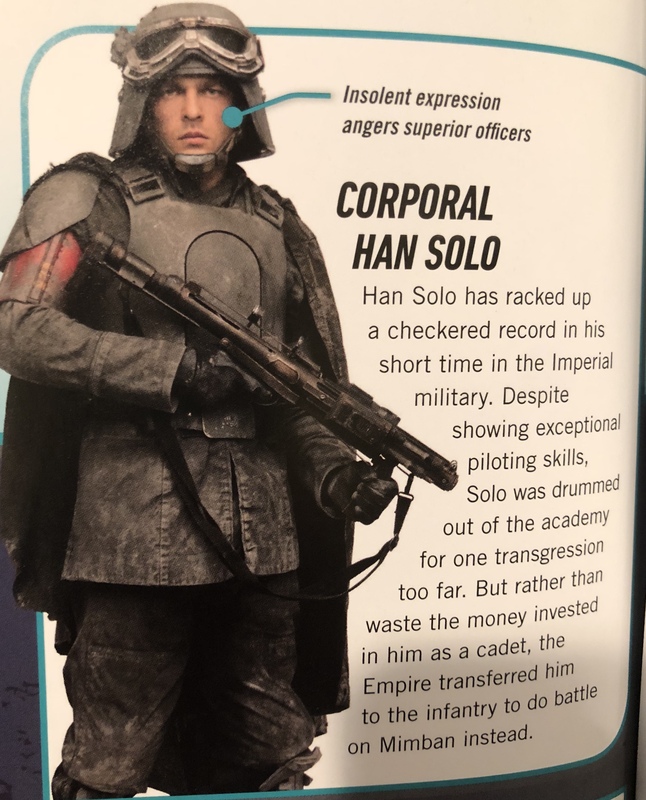 After getting kicked out of the Imperial Academy on Carida, Han was reassigned to glamorous duty as an infantryman and got sent to slug it out in the mud on Mimban. Despite getting such a choice assignment, Han decides to walk away from Imperial military service to join Beckett’s band of miscreants. “Deserter” is a military criminal term that has worked its way into our everyday language—it has even officially made its way into Star Wars films, starting in The Force Awakens with Finn. 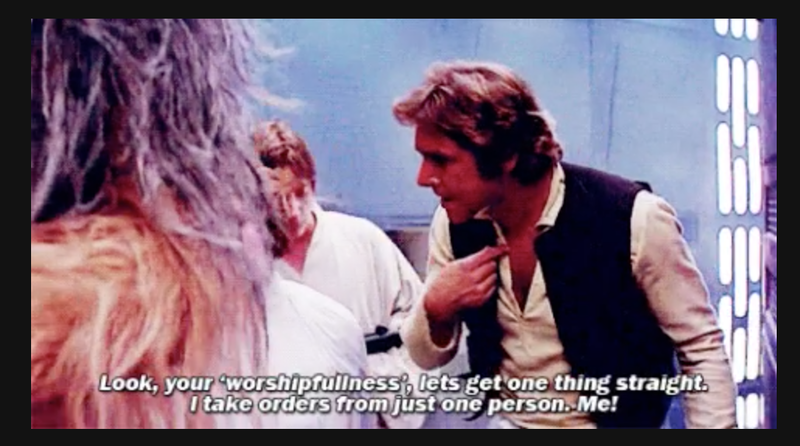 In reality desertion is a complex and serious crime that is unique to the military, which makes it worth asking whether Han’s actions in Solo really amount up to a violation of military law. It’s a well-known fact that Imperial JAG prosecutors and their impeccably crisp accents are far more feared than THE BEAST. In its simplest form, desertion is the act of leaving one’s post without authority. Desertion is the bigger, badder brother of absence without leave (more commonly known as AWOL), which is a separate crime. The key difference between the two crimes is that desertion requires proof of intent to remain away permanently. Militaries around the world have been dealing with soldiers running away from duty for centuries. The United States military certainly hasn’t been immune to the problem, having dealt with deserters as far back as the Revolutionary War. Over 200,000 men deserted from the Union Army in the Civil War. In World War II, the military tried and sentenced roughly 20,000 deserters. Real world desertions have continued despite the transition to an all volunteer fighting force, with roughly 5,500 service members deserting in 2003-2004, just after the invasion of Iraq. Several famous faces have had brushes with these crimes, including General George Custer and The Great Escape actor Steve McQueen, who were both punished for AWOL stints involving running off to see a special woman in their lives (sound familiar, Han?). 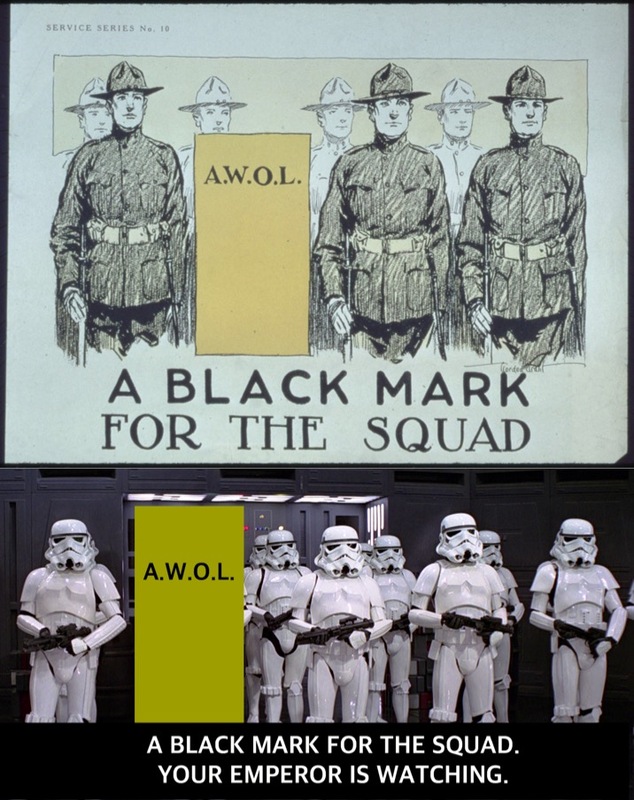 Given the Imperial military’s sheer size, its penchant for forcing citizens into service, and the inherent danger of service, it’s a no brainer that the Empire probably has its fair share of desertion and AWOL problems. Desertion is a crime unique to the military that stems from the nature of military service. For the average worker, if you don’t show up to work you might get fired, but you won’t get hauled into court or tossed into a filthy pit with THE BEAST. Instead, someone else gets hired to fill your place and the world keeps spinning. However, unlike most civilian jobs, service members can’t simply walk off the job, quit, or refuse to do something. The basic nature of military service means forfeiting a measure of free will. In today’s volunteer force, service members sign contracts that obligate them to serve for a particular period of time. During that time, you are legally bound to obey the orders of your superiors until you are lawfully discharged from service. My own active duty service provides a perfect example of this give and take: Back in 2012 I had plans to attend the big Star Wars Celebration convention in Orlando. My tickets, airfare, and hotel were all locked in and I was all set to go…until I received orders to deploy to Afghanistan. Even though I desperately wanted to go to the convention, my military obligations sadly trumped Star Wars. Having voluntarily enlisted in the Imperial Navy, Han was similarly obligated to serve out his time until discharged. The look of an Imperial service member who is ECSTATIC to serve the benevolent Emperor. Desertion is one of the most serious crimes under the Uniform Code of Military Justice (UCMJ), which is the body of law that governs each military branch. Desertion in a time of war can be charged as a capital offense, meaning that the death penalty can be imposed. That tough approach is tied directly to the huge negative impact desertions can have on military units and their ability to effectively fight. That the accused remained absent until a particular date alleged. I’ve got a bad feeling about Han’s chances at beating a desertion charge. When Han decides to join up with Beckett and Val, he is still assigned to the Imperial 224th Armored Division “Mud Jumpers,” who have been deployed to pacify Mimban (a planet that probably totally deserved to be invaded by Imperial forces). Han absents himself from his unit and his assigned place of duty on Mimban by hopping aboard the stolen AT-Hauler and flying off planet, thereby satisfying the first element. Han clearly had no authority to leave Mimban. When most civilians leave work, their time is their own. However, service members are generally considered “on duty” at all times, even after hours. Absences such as vacations (commonly called “leave”) or R&R from a combat zone must be specifically approved by commanding officers. In Han’s case, he doesn’t have any authority to leave his unit. In fact, just before joining up with Beckett, Han’s commanding officer had issued orders for his unit to move out for the southern marshlands. Han wasn’t given any authorization to leave the campaign or the planet, which means that the second element is met. Unfortunately for Corporal Solo, he is lawfully bound to take orders from many, many other people. The third element of desertion involves proof of the accused’s specific intent. This element is often a tricky one, because it involves proving a person’s internal thought process. However, you don’t necessarily need a confession to prove one’s intent to desert. Under the UCMJ, evidence of one’s intent to remain away permanently can be drawn from a wide variety of circumstances, including the length of the absence and statements and actions of the accused. Han arguably provided ample evidence that he never intended to return to Imperial military service. Han not only walked away from his unit, but he completely jumped planet, running light-years away to the Mid-Rim planet of Vandor. This would be akin to a real service member leaving his post in Georgia and turning up in South America, and it constitutes strong evidence of his intent. Moreover, Han’s actions in committing crimes against the Imperial military, from aiding in the theft of the AT-Hauler to the brazen robbery of the Imperial Conveyex train, strongly suggest that he intended to remain permanently away from service. After all, Han had every opportunity to surrender to Imperial authorities in both instances, but instead chose to remain on the run. Han also manages to blatantly admit to his intent when he tells Beckett that he’s already a deserter. Thus, Han’s actions and his own big mouth amount to substantial proof of the third element. The final element, which requires that a closed period of desertion be alleged, would ultimately be satisfied after Han was captured and charged. Sadly, the UCMJ does not currently recognize the “It’s not my fault” defense. Unfortunately for Han, the odds of him being acquitted of desertion are approximately 3,720 to 1. Even though Beckett was right that the Empire doesn’t send out enforcers to track down deserters, the crime would permanently hang over Han’s head, as the statute of limitations is “tolled” (pauses) while someone is absent without authority. For Han, that means having to live life with Jabba’s fat bounty on his head and the ever present prospect of an Imperial court-martial. That’s what I call being in deep bantha poodoo. Previous articleDoes Altered Carbon’s Resolution 653 Pass Constitutional Muster?